The Long Night has come. The Systems Commonwealth, the greatest civilisation in history, has fallen. But now, one ship, one crew, have vowed to drive back the night and rekindle the light of civilisation. On the Starship Andromeda, hope lives again. He is the last guardian of a fallen civilisation, a hero from another time. Faced with the universe in chaos, Dylan Hunt recruits an unlikely crew and sets out to reunite the galaxies. 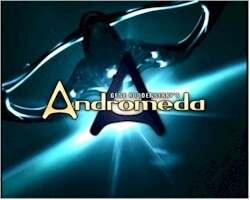 On the Starship Andromeda, hope lives again. The universe is a dangerous place. But in our future, my crew and I fight to make it safe. I am Dylan Hunt, captain of the Andromeda Ascendant, and these are our adventures.